So here we are overlooking inspiration point in Bryce National Park in Utah over thanksgiving weekend. Bloody amazing place - its breathtaking (literally as was 11,000 ft above sealevel so we got dizzy just getting out of the car!). Zion and Bryce are such beautiful parks. 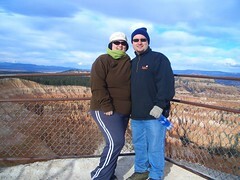 Hardly any folk at Bryce when we went so we enjoyed bundling up. Next day was back into the high 60s by St George the town we stayed at.